Wow. This weekend has some seriously amazing deals for only 50L. Most are (as usual) for tiny avatars, but some - in particular the fabtastic Super Koi Goldfish - would be a fun addition to any avatar's decor. The Meeroo belt also comes in humanoid size, as well! The TSW items are only 50L until Sunday night so visit the stores soon and look for the yummy blueberry waffle! 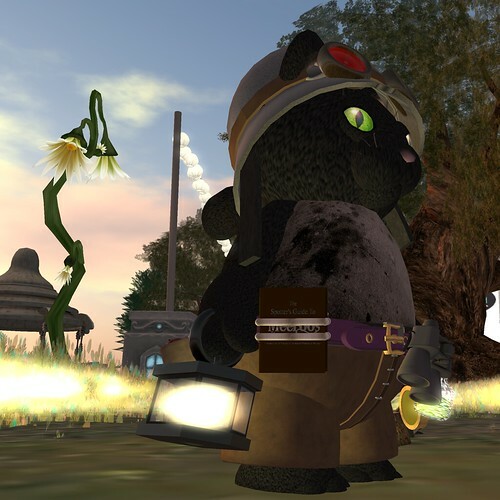 Meeroos are all the rage and you need to be fully equipped with this fab Tiny Meeroo Belt from Funny Bunny to be fashionably suited up for your Meeroo spotting outings (belt also comes in humanoid size!). Belt has lots of cool features including a guide book, binoculars, treats, and more! If you plan on being out at night, grab the super cool A Hiro's Lantern from O'rain Song to make sure you find those Meeroos! The belt and lantern are both 50L this weekend. The rest of this Meeroo hunting outfit is also from Funny Bunny - the Wasteland Outfit without the jacket (not on sale). 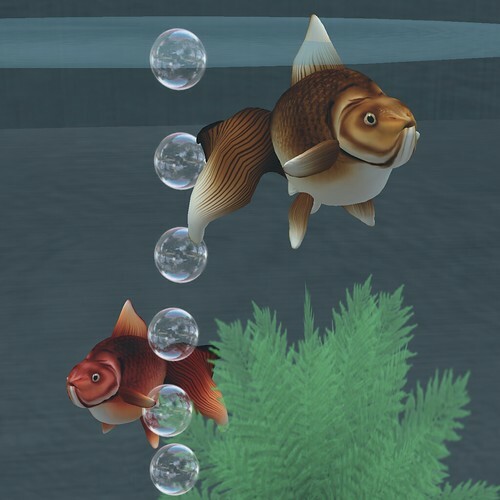 These fabulous fish are part of the 50L sale item Super Koi Goldfish from Grendel's Children @ Raglan Shire. The kit comes with eight fish that swim, eight fish that gaze out at you, a bubbler, plant, and a goldfish bowl. You can also put the fish in a tank or pond, too! This is an amazing deal for 50L - the fish are beautifully sculpted and textured. 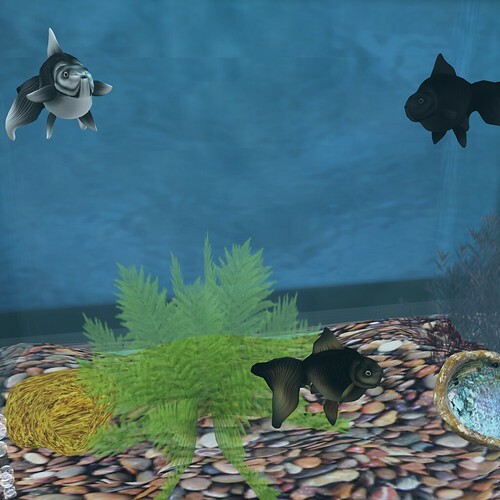 If you want a tank a little bit bigger, or different kinds of fish, pick up the aquarium kit (also from Grendel's Children @ Raglan Shire). My favorite is the tv tank with the optional bookcase underneath. This kit is unbelievable - the amount of options lets you create your own unique looking aquarium. The fish for this kit also come in two types: ones that look at you and wiggle (adorable! ), or the ones that swim around. You can set the radius for the swimming fish, too, so if you want to put them in a larger body of water it is super easy! 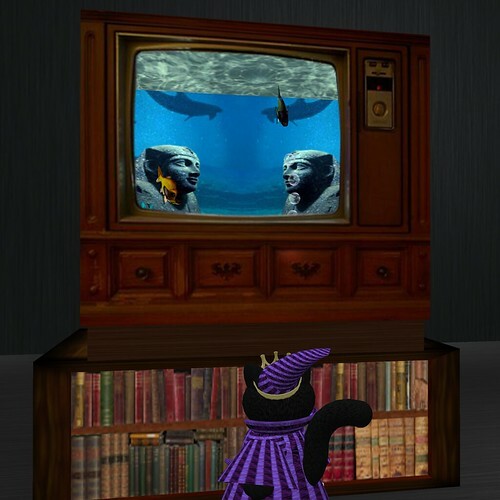 A perfect outfit for watching your fish in the tv? Tiny TAMA's Royal Jammies Mega pack - an astounding six color set of pajamas, royal slippers, caps, and teddy bears all for the insanely low price of only 50L this weekend. More of the options for the aquarium tank set. Lots of different types of coral, sponges, plants, bubblers, and ground materials... it's a ton of fun to set up! After all the watching of Meeroos and fish it's time to go out and spread some ferrety fun. 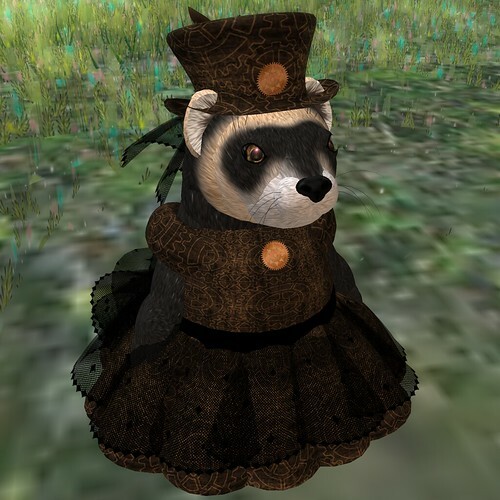 Izo's Steampunk Ferret Dress is a stunning outfit. It comes with dress, hat, and optional apron, and is only 50L until Sunday night!